This proclamation, issued by Missouri governor John S. Marmaduke, calls upon the Missouri Pacific Railway Company to resume traffic of all kinds following a disruption caused by striking workers. 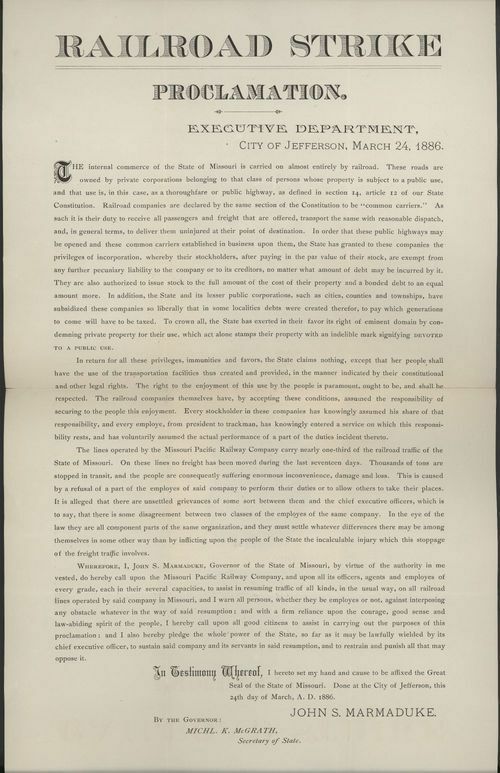 The governor warns all persons against interposing any obstacles and pledges the "whole" power of the state of Missouri to restrain and punish anyone who may oppose the proclamation. The proclamation was issued after local authorities and private citizens demanded an end to disruption of business and community life following railroad workers riotous activities.